It was all The Nutcracker's fault. Well, that and my sister's tap shoes. 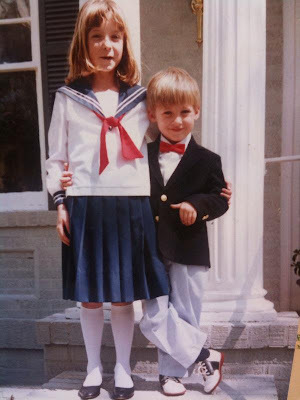 Every Christmas since the age of 1, my family would drive to Atlanta, stay one night in the grandest hotel, and see The Nutcracker at "The Fabulous Fox Theatre"
It was the grandest of occasions, and the best part was dressing up. 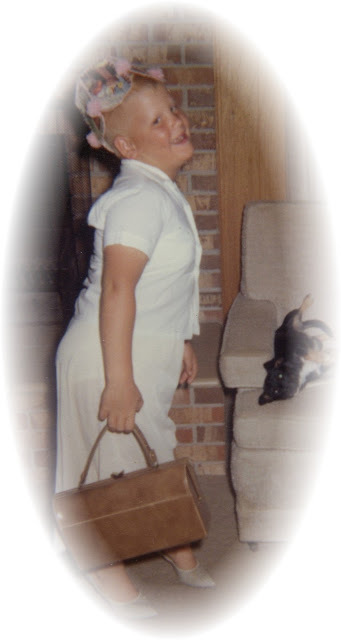 I'd wear white buck shoes, seersucker pants, suspenders - and therefore felt invincible. It was my gay childhood version of the Superhero Costume. In those rags, no one could stop the Sugar Plum Fairy from leaping out of me - and down the stairs, across the front lawn and all the way through the lobby of the glitzy Ritz Carlton. I was spoiled rotten with love and support. Today, I'm a set designer living in New York City. And I have this life because my parents knew exactly how to channel my desires into a constructive path for myself. So, thanks to my Mom & Dad - who are celebrating their 39th wedding anniversary this year! Both my parents thought I was adorable, though not as much as I did. That's my dog Queenie is in this photo with me. I was in 2nd grade when I knew I was attracted to boys. His name was Butch and he had a sweet blonde flat top haircut, and was a little stocky. And I thought singer Bobby Sherman was dreamy! By 7th grade I was teased about being queer by other kids. My parents (mainly my father) started having trouble with my lack of masculinity in Jr. High. Not only was I gay, I was fat - the double curse. I was horribly beaten in Physical Education class. Even the PE teacher called me a pansy! I had to pay them to stop, and I relentlessly tried getting out of going to the class. My middle school years really beat me down. At age 21, after 3 years at a fundamentalist Christian college, I came out. At age 22 I came out to my mother when I was in the hospital and on narcotics. She was sure that my being gay was her "fault." I adore this photo and the sheer luxury I had to express myself. But that freedom was soon taken away and not rediscovered until many years later. Today, I am a very well respected psychiatric nurse practitioner and my life's work is to comfort people with challenging lives. Part of that includes supporting all kinds of people to be exactly who they are meant to be. My message to young LGBTQ kids is to be patient. Do all you can do to be your genuine self. The more truth you tell, the happier you will be. Who you are matters, and tell yourself that truth first. No matter how trapped you may feel, it will get better. No man, woman, religious leader, politician, or teacher can define who you are. ONLY YOU define who you are. Be YOU and be proud, and keep a sense of humor.